of Rural Bible Mission, in the winter of 1995. It was dated Feb. 14, 1995. 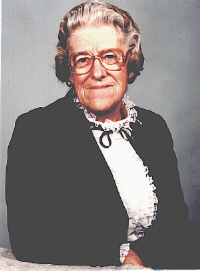 Gramma Hoover was staying with her son Don and his wife Deb in Lincoln, Illinois at that time. Your letter was forwarded to me here in Illinois. Thank you! I very much enjoyed it. I was there when the workers interviewed you and your husband at RBM. I did stay for dinner but left before I had a chance to meet you. And I met your husband just before I came down here. Now about me! My twin brother* and I were born in China of missionary parents. They returned home after 8 years of service due to my mother's health. My brother and I were only 2 years old, so don't remember China, but he was determined from an early age to return there as a missionary, which he did. We both dedicated our lives lives at the Gull Lake Bible Conference, and my younger brother as well. We grew up in Kalamazoo, graduated from Wheaton College--and went our separate ways, twin brother to Dallas Seminary and brother Don [Ebeling] and I to Philadelphia School of the Bible. There I met Glenn Hoover whom I would marry. After P.S.O.B., Glenn and I went to National Bible Institute in New York for the missionary medical course. While at P.S.O.B. the Lord spoke to us (separately!) about Africa, and in 1935 I went on alone with the Africa Inland Mission. Glenn had home responsibilities (parents) and could not leave then. Fourteen months later he joined me and we were married in Tanganyika (at the time) east Africa., where we served for 4 terms. Our first two terms were over 7 years each. All 4 of our children were born in Tanzania, and schooled at Rift Valley Academy in Kenya. Three graduated from High School there, but #2 son was "caught in the middle" and had his last year at Kellogg High School in Hickory Corners [Michigan]. He then went to Grand Rapids School of the Bible and Music and the 2 older children to Western Michigan University, while we went back to Africa and our youngest son with us. We returned home at the end of 1967 for furlough---which proved the last one. 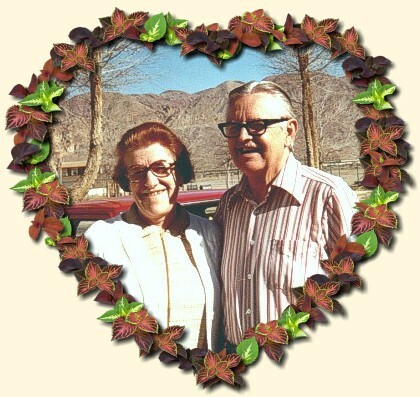 Elmer Deel called Glenn in (2 weeks after we arrived back) to help Mrs. Hitchcock in the office, and he was with RBM (Rural Bible Mission) until his death in 1981. I had done volunteer work, working with Glenn through the years, so knew the work. So Jack Road gave me his job in the print shop and mail room and I have been there ever since. I neglected to say that my younger brother arrived in Africa (also with AIM) in time to give me away at our wedding. Africans couldn't understand why he gave me away instead of demanding a dowry! Since my brothers and I were all missionaries my father bought a cottage on the Bible Conference [Gull Lake] grounds so we would have a place for furloughs, and now it is my home. I thank God for all His leading in my life and for the privilege of serving Him through the years....Thank you again for your letter. *Her twin brother was William (Bill) Ebeling. Here is a letter that Charlotte Hoover wrote in 1944 to her home church in Kalamazoo, Michigan. It was printed in the August 20, 1944 bulletin of Calvary Bible Church. Glenn and Charlotte Hoover had been away on a vacation in Africa with the 2 children that they had at that time, Donald and Elizabeth. Greetings with love in our blessed Lord. We did not get a letter off in March because of traveling. We arrived home March 17th. Holidays are nice, but there is certainly no place like home. And we find there is a lot of work to get caught up on after 2 1/2 months away. A ton of paper arrived during our absence, so we are busy printing again, too. After we left Mt. Kilimanjaro we had a few days in Nairobi, doing a bit of shopping, and then spent a week at Nyakach with the Capons. Not being able to get reservations on the boat we had intended returning to Tanganyika on, we accepted the Capens' invitation to visit them. We had a lovely week of fellowship with them and know the Lord directed us there. The Sunday we were there Glenn spoke in the Church service in English and Mr. Capen translated it into Luo, and I spoke in the Sunday School with Mrs. capen Translating. The day before we left, Mrs. Capen and I went by bicycle to a large market to preach to the hundreds of people gathered there. We were only able to witness to one group, though, because it suddenly grew very dark and a hard storm was gathering. We knew there was no shelter there or anywhere along the path, so hurried home as fast as we could, and got into the house just as the storm broke. They are on a high plateau overlooking the great Kano plain, with Lake Victoria stretching away in the distance, and it was truly a majestic sight to see that great storm sweeping across the plateau and the plain. We all, with the exception of Donald, enjoyed the boat trip home. Donald was in bed with cold and fever all the way. We were 3 days in Mwanza but did not see Don [Ebeling] at all. When we arrived at Lohumbo R.R. Station at 4 A.M. we found there was no lorry to take us the last lap to HOME, so instead of waiting for someone to go for my bicycle, we decided it was more profitable to walk. Fortunately Glenn had his bike, so he pushed Donald and a suitcase home on that, and I pushed the baby carriage with Elizabeth and a couple of baskets in that. We were home in time for breakfast, after a lovely moonlight walk. Miss Tilley and Miss Higgins were surprised, to say the least, to see the Hoovers come walking in! Miss Tilley has not recovered from her Blackwater fever as rapidly as we had expected she would. She needs a complete rest, but always having been so active finds it hard to really REST. Miss Magnin has not returned and will not be home before June at the earliest, so Miss Higgins has been sent here to stay with Miss Tilley until Miss Magnin does come home. We have had good rains here at Lohumbo and the famine conditions have greatly improved. In another month the people should be getting a good harvest. The famine is still very bad at Busia, and even the missionaries have suffered there with no milk and no vegetables. How thankful we are that God moved us with our little children and brought us to this "land of plenty." We have an abundance of vegetables and milk here, and have even been able to share with thee Busia folk, which has helped them greatly. Because of the famine conditions many districts have slowly been depopulated, while at present this district is growing in population. Hence many more opportunities to witness and proclaim the Gospel message. Just recently I had real joy in witnessing to a man who said he had never before heard of the Lord Jesus. He was standing near our little church on Sunday morning, and when I invited him into the service he said he was afraid. I told him there was nothing to be afraid of, and showed him the way of salvation, but he went away without accepting and I have not seen him since. That same day a young woman who was saved here on [December 24th] brought all her charms and things used in devil-worship, and wanted them burned. Her father had told her years ago when she wanted to "believe" that he would turn her out of the house, and she through fear of him, kept on in her heathen worship. She was definitely saved on [December 24th], and again her father has threatened her with being turned out of her home if she does not denounce it all and "stop being a Christian." But she refused to deny her Lord, and has taken even a more open stand by burning her charms, etc. She needs very much prayer, for the devil himself will seek to turn her aside from wholly following Christ. And only in Christ will she continue to live victoriously. We must stand with her against all the onslaughts of the enemy. One poor old woman I talked to recently thought the way to heaven was by the "coast"---her boy had gone to the coast, and that was the most wonderful place in all the world to her. So I had such a sweet opportunity to open up to her the ONLY way to heaven, even the Lord Jesus, who is the Way, the Truth, and the LIFE. I am trying to get out every Tuesday to do village work, and covet you prayers in this ministry. We are soon to have a baptismal service here. But Glenn has just told me that of the whole number who have been in class for candidates each week, only a few show evidence of really being ready for baptism. Those who are "professors" and not "possessors" of eternal salvation we do not baptize, even though it means we can only report a few. There has been much wholesale baptising and admitting to church fellowship of those who have made a profession of salvation, but have never been born again. Do pray much for us in our stand against this evil practice that prevails on Mission fields today. May God keep us from doing things for outward show that which will in any way hinder any soul from knowing God. many in our churches here, as at home, are perfectly satisfied to be a church member and are utterly unconscious of any spiritual need at all.